At the end of March, the Samsung Galaxy Note 9 apparently was run through Geekbench. Sporting the Snapdragon 845 mobile platform, this is the model that will be found in the U.S. and in China. The test produced a single-core score of 2190 and a multi-core score of 8806. Today, the European version of the Galaxy Note 9, powered by the Exynos 9815 chipset, appeared on Geekbench and produced impressive results. The single-core score hit 5162, and the multi-core score reached 10,704. UPDATE: There are some caveats. We couldn't find this result on Geekbench's website, and as some have pointed out, RAM is usually expressed in MB, not GB. Furthermore, the Exynos chipset would have been posted as "universal9815." So unless we can come across the actual listing, we have to assume that this result is a fake. Hey, no need to fret. The Galaxy Note 9 will be a powerful device anyway. 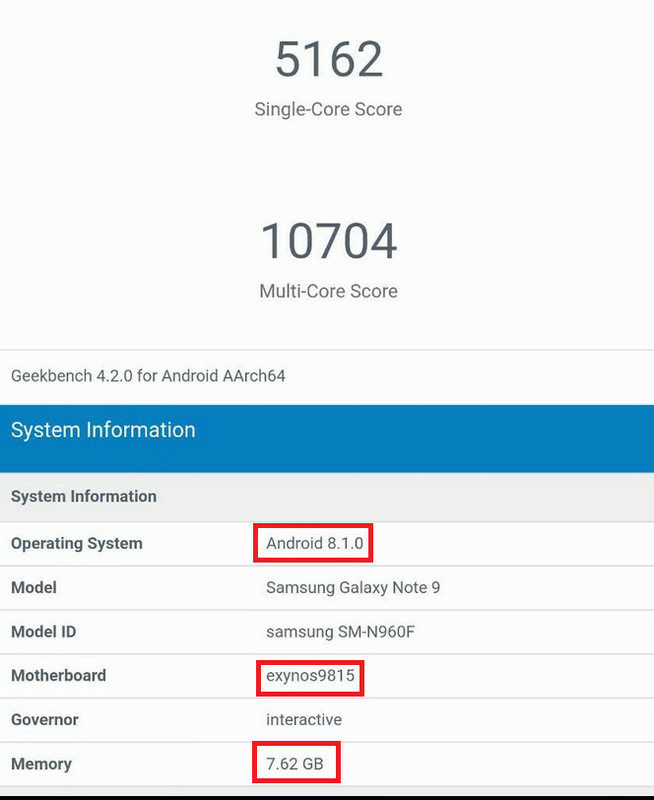 The rest of the specs as seen on Geekbench include 8GB of RAM, and the device tested was running on Android 8.1. For the record, the A11 Bionic chipset found inside the 2017 Apple iPhone models tallied a single-core score of 4061 and a multi-core score of 9959 on Geekbench. That would seem to indicate that if these results are legit, we will see some unworldy performance from the Galaxy Note 9. We expect the device to carry a 6.4-inch Super AMOLED display with a 1440 x 2960 resolution, and an aspect ratio of 18.5:9. A 4000mAh battery is rumored to be onboard along with the same dual 12MP camera setup found on the Galaxy S9+. At this point, we probably won't see an in-display fingerprint scanner until it appears next year on the Samsung Galaxy S10. We could see the Samsung Galaxy Note 9 unveiled a little earlier than usual this year, possibly as soon as July or August. Hell yes! Give me the Note 9 now! 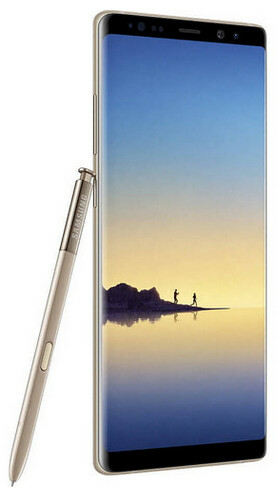 Still hope it would be a tad smaller than Note8 , and same screen size. That's an insane hardware package. I doubt any phone this year is going to be able to challenge it. The iPhone, obviously, will dominate it. Why would that be obvious when the current iPhone loses in real world testing to the current Note? Opening and closing apps rapidly like some psychopath? Sorry - no. Playing PUBG (As Fornite - the best battle royale that isn't on Android) side by side with an iPhone and Note, the Note starts to overheat and lag consistently. Get those app tests out of here. PUBG, 4k on-device editing, and others alike get crushed. Keep trying to hard, proven fact. Not many people buy the note 8. How? I'm talking about the hardware package you're offered. The Note 9 will probably have a Pen, SD-card slot, headphone jack, stereo speakers and a 4000 mAh battery. It's quite safe to say that the Note 9 is going to have more than that, but those are just some of the things which the iPhone doesn't have at all, so how on earth does the iPhone have a better hardware package? You can say that iPhones don't need as big batteries, but the iPhone X is already losing to the Galaxy S9's in battery tests, and they only have a 3000mAh and 3500 mAh battery, which is smaller than the 4000mAh for the Note 9. Aoooooooooooo, you are so funny, did you sleep in saltwater?! Fingers crossed for flat screen, no gimmicky edge screen needed on a workhorse like the Note series. If you used the Note 8 or S9 you would know that the curve is so subtle that you barely notice it anymore. It's like having a phone with 2.5D glass. BS! Edge on Note is so minimal, so no problem for S Pen at all. And it's not ''gimmicky'', but best design for holding and operating with one hand large phones. BTW apple-doezn't-rulz since long, long ago. Just saying! You are the epitome of the word “sheep”; the curved screen does indeed interfere when trying to write or screen capture near the edge of the screen. It’s clear you’ve never used a Note series device. No no, it's clear that you're the one who never used the Note 8. As I said before, the curve is so subtle you barely can notice it. And how ironic of you to call someone a sheep with a username like that, and from someone who doesn't skip a chance to glorify Apple and troll on Samsung. The curve gets in the way of S-pen functionality, no matter how much you wish that wasn’t true. NO, it does not. You can write edge to edge with the pen. And why do you even care apple fanboys. No, it does not. The edges are very steep. Like another said here, it's no different than 2.5d glass. Yes it does, your RDF notwithstanding the edge screen is not conducive to the S-pen. Yes it does, stop lying to yourself. I have the s8 in my picture and I would definitely buy the non curved version if there was one. Don't use the Edge features & it's just an infinity display. Fake benchmark. Completely edited. First of all this Model ID wasn't found in Geekbench database. Secondly Geekbench always specifies RAM capacity in MBs. Not GBs. 3rd, it'll come with 8910 as seen on S9 exynos version. Geekbench app shows RAM in GBs. Unfortunately, we'll see the SD version here in the US. So what will be the real difference between Note8 and Note9 ? It should has new exciting things otherwise will be hard to sell it !